Poland has denied planning to kill almost all of its wild boar after a public outcry. It was claimed 210,000 boars would be culled in the coming weeks, to stop the spread of African Swine Fever. Over 350,000 people signed a petition to stop the killing, and hundreds of academics publicly opposed it. Environment minister Henry Kowalczyk insisted no order had been given to wipe out the boar population and officials spoke of a misunderstanding. More than 800 Polish academics signed an open letter to Prime Minister Mateusz Morawiecki demanding an “immediate” halt to the cull, and recommending “alternative actions”. How big is the cull? Some 168,000 boar have been killed since last April as part of a total target of 185,000 given to Poland’s PZL hunting union for the entire hunting season up to April 2019. 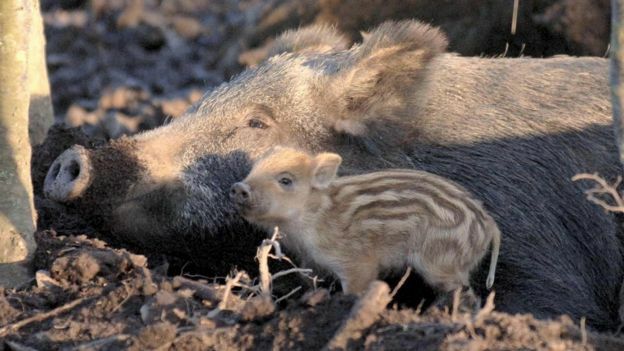 Instead of another 210,000 wild boar being slaughtered this season, the number was more like 20,000, said Grzegorz Wozniakowski, head of the Swine Diseases Department at the National Veterinary Research Institute. A further three culls are due to take place, starting this weekend. Estimates of the Polish boar population vary, but they are still thought to number at least 200,000 and at the most 500,000. The minister also denied that hunters were ordered to shoot pregnant sows, and sows with piglets – something that had drawn particularly strong condemnation from experts and the public. African Swine Fever – or ASF – is a deadly virus found in pigs. It was detected in around 3,200 wild boars and pigs in different locations across Poland between February 2014 and last summer, according to the Polish news agency PAP. It is not harmful to humans, but is almost always fatal for pigs and boars. Dr Wozniakowski told the BBC that culling wild boar was the only way “to protect against the further expansion of African Swine Fever, especially in the summer”. “The [hunting] plan was drawn up like every year,” Mr Kowalczyk said, adding that the 168,000 boars already killed “isn’t much compared to previous years”. According to the PZL, 308,000 boars were killed in the year 2017-18, and 282,000 were hunted the year before. How big are the protests? Thousands of people showed their support online by changing their Facebook profile photos to one of a wild boar. 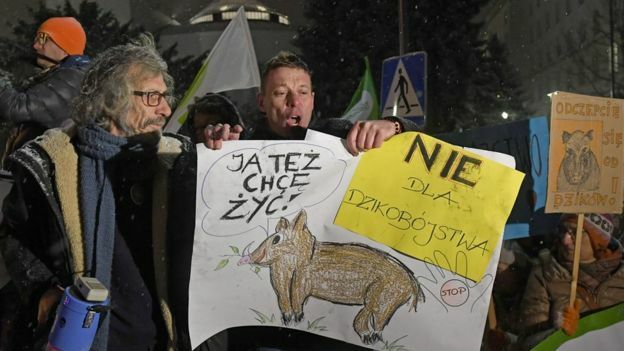 One Polish activist has even created a boar “frame” that users can add to their existing profile photos – so that the picture stays the same, but with a small boar in the corner. Hunters spoke out against the cull, too – warning that without wild boar to prey on, predators like wolves would move on to farm animals like sheep and cows.